Things have been very busy over at the Googleplex! Hot on the heels of the launch of Priority Inbox, yesterday evening Google announced a major update to search functionality: Google Instant. In a nutshell, Google Instant dramatically speeds up searching by displaying results ‘as you type’. At the moment it is only live on Google.com, it will roll out on the UK site next week. Faster Searches: By predicting your search and showing results before you finish typing, Google Instant can save 2-5 seconds per search. “Our key technical insight was that people type slowly, but read quickly, typically taking 300 milliseconds between keystrokes, but only 30 milliseconds (a tenth of the time!) to glance at another part of the page. This means that you can scan a results page while you type. While Google Instant won’t actually affect how search engine optimisation works, there will be an impact for brands that use both organic and paid search strategies as part of their marketing. 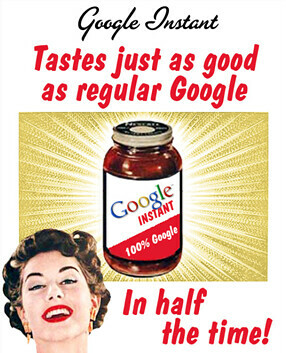 Essentially, Google Instant can be viewed as a series of mini searches. Every time someone adds a letter or character in the search bar, the search results change and different companies will be displayed. Google has said that a three second pause (by the searcher) will now count as an impression. This means that search impressions are likely to skyrocket, but click throughs will stay pretty much the same. This will clearly impact on the ratio between impressions and click throughs. For example, imagine you were searching for Google Instant. Type in ‘Google’ and the search field automatically shows results for ‘Google Maps’. Type in ‘Google I’ and the search field shows results for ‘Google Images’. It’s only when you type in ‘Google In’ that you get the correct results. Now, if Google wanted to give more prominence to ‘Google Instant’ in searches, then they could consider buying some Adwords against the term ‘Google’ and ‘Google Images’ or optimising organically for this. The demise of the long tail? If this example was applied to other businesses or keywords then you will probably see brands potentially having to spend more money on more expensive PPC terms to increase visibility. If you are number one for a particular search term, type in half of that term and see if you come up. If you don’t, then you’ll possibly need to rethink some of your keywords. The other downside is that these more common keywords will become more competitive. If you’ve any further queries about your own search strategy and how this might impact things or how our SEO agency can help, then please do give the dotSEO team a shout.